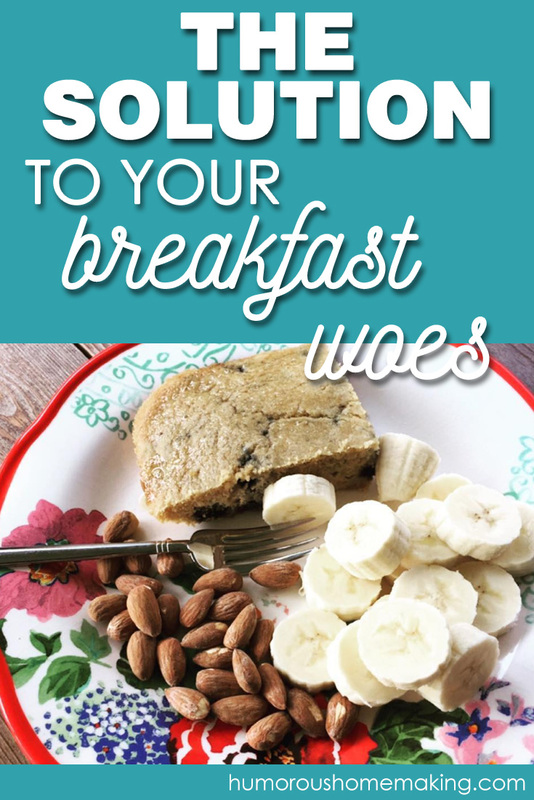 I previously shared with you my 10 easy go-to breakfast recipes and today I want to share another helpful breakfast idea. For a while now, our family has been using a method that has really revolutionized life for us. 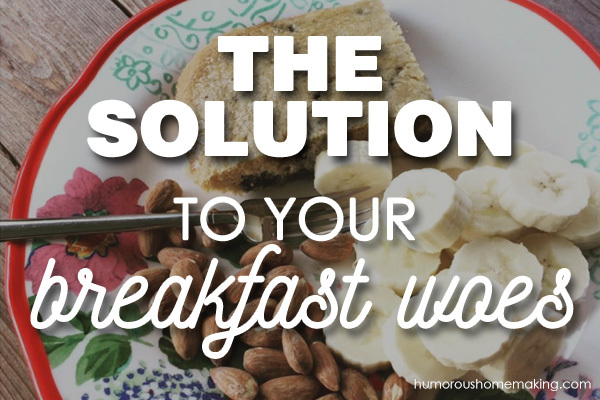 It just might be the solution to your breakfast woes! You all know I love to cook. More than anything, I love to cook breakfast. Breakfast is my favorite meal of the day. I love me some breakfast, girl! Butter, syrup, butter, muffins, butter, coffee, butter, butter in coffee. My first thought in the morning is – I’m so glad it’s almost breakfast time! Or you guys that wake up and say, “No thanks, I don’t eat breakfast.” I don’t understand you. I mean, we can be friends, but I don’t understand you. My kids are the same way – they want to know all about what they’re gonna have for breakfast the next day as they climb into bed. For those of you who are breakfast people (and those of you who wish you were) – I’ve got the solution to your breakfast woes. I was finished stressing over what to make each morning. I was tired of dirty skillets, griddles, saucepans, spatulas, pancake turners, etc. every morning. My solution? A new method where we eat the same thing all week for breakfast. Five mornings in a row, Monday thru Friday, we have (basically) the same breakfast. Each Saturday, I make our breakfast for the week, taking however much it takes to feed us for one day and then I multiply that by five. This make-ahead breakfast is usually something that can be reheated easily or doesn’t require being heated up at all. I chose Saturday to cook our breakfasts because that is my slow day. It may not be a slow day for you – just pick what works best for you. I’m continually amazed at how much time make-ahead breakfast to reheat saves! People always ask me, “Don’t you get tired of eating the same thing every day?” The answer is no – because it’s not every day, it’s just for five days in a row. And no, we don’t get tired of it. We all know that the weekend’s coming and for two days we’ll eat something different. The next week, I’m going to make a different breakfast that we’ll enjoy for the next five days in a row. If you keep a good variety, your family won’t get tired of having the same thing five days in row. I also may mix it up a little. As an example, we recently had baked pancake for our breakfast for the week. I made several different flavors, so even though we had baked pancake five days in a row, there was still variety built in. Every Friday, I post our meal plan for the week on Instagram and Facebook. Breakfast Sliders made with bread, butter, eggs, cheese and meat of choice. All you do is reheat in the toaster oven for 8-10 minutes or microwave (50% power). These were so, go good. We will definitely be rotating these pretty regularly. Breakfast Toast. I know when I said “Breakfast Toast” on the menu a few weeks ago, some of you were like, what? But I saw a pin on Pinterest that piqued my interest and we tried it. Success!! We’ve had peanut butter, banana and chia seed — almond butter with sliced apples and toasted coconut — refried beans and fried eggs. It’s simple yet filling, and all I had to make in advance is the bread. Several large batches of muffins. For us, 3 batches of muffins, served with yogurt and fruit, would feed our family of 6 for the whole week. A double or trip batch of pancakes. Easy to make these and freeze or refrigerate. Pancakes easily reheat in the toaster oven each morning. Baked Oatmeal multiplies and reheats really well! I warm ours up in the toaster oven, microwave – it’s even good cold straight from the refrigerator. I have so many great baked oatmeal recipes on the blog. Cottage cheese with berries and granola was a recipe I just recently found on Pinterest that turned out so well. Just make a double batch of granola and have enough cottage cheese and berries on hand for the week. Granola with yogurt and fruit is another easy idea. I made this a few weeks ago, when I knew we were going to be gone over the weekend (Thursday to Sunday) and I would lose my Saturday breakfast making day. Wednesday before we left, I made a huge double batch of granola because it keeps so well. And then we were all set for the week as soon as we got home. Overnight oats are easy to make and still taste good all week long. When I make them for the week, we usually have a few different kinds. If you put things in them like fresh berries, be sure to eat those first. Some of my favorites are from Dashing Dish – Snickers Overnight Oatmeal and Brownie Batter Overnight Oatmeal. Oven Omelets (fancy people also call this a crustless quiche) are easy to cook in bulk. Let it cool before you cut into squares and then store for up to a week in the fridge. This reheats beautifully! There’s just something nice about knowing when you wake up in the morning that breakfast is ready. Stacy, what kind of yogurt do you serve your family? I only buy plain Balkan yogurt as I find the flavoured ones have so much sugar and yucky additives, yet my kids don’t like the tartness, even when I add honey. Thanks! So sorry – this comment went to SPAM for some reason! Typically Stacy buys plain Greek yogurt or plain traditional yogurt. Her kids don’t seen to mind the lack of sweetness as long as there is some sweetness in whatever she serves alongside the yogurt. She doesn’t typically serve it plain. I’ve never had Balkan yogurt – is it thicker like Greek? Thanks Kristy! You are so hilarious!!!!!!! LOL! Well, we can be friends because I too NEVER forget to eat breakfast! Glad you appreciated the post, Laura 🙂 And eating breakfast on the patio – what a great idea!